The 501st Legion, a group of dedicated and talented Star Wars cosplayers, has collected fifty storm trooper helmets customized by actors, artists and more besides, and is auctioning them off for charity. It seems to be the done thing this Summer to amass dozens of customized Star Wars helmets and auction them off, but unlike last month's Vader Project auction, the 501st Legion's TK Project is all about raising money for the Make A Wish Foundation. 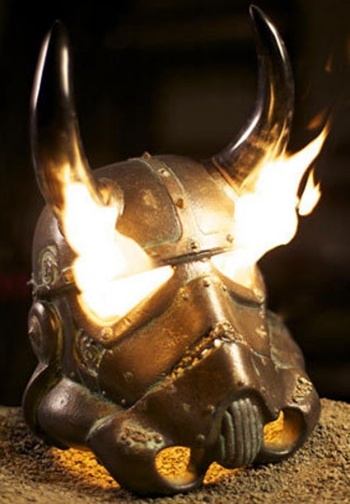 The project was started around two years ago, and includes contributions from a number of Lucafilm artists, Star Wars actors like Peter Mayhew (Chewbacca) and Ray Park (Darth Maul), and fans of the movies like the Robot Chicken chicken team and Mythbusters' Tori Belleci - whose flaming Viking helmet is pictured to the right. The helmets go on auction later today at the Star Wars Celebration V Convention in Tampa, Florida, so unless you're there already, chances are you won't be able to get your hands on one, but if you want to take a look at some of the completed helmets, you can check out the project's blog. One of the prerequisites for joining the 501st is a professional quality Star Wars costume. These aren't always commercially available, so members will often make them themselves, and a project like this seems a wonderful use of those skills. As impressive as the Darth Vader helmets were, these have much more appeal, to me at least, because there's no profit being made. Instead, it's just people who love Star Wars, using that love for a good cause.